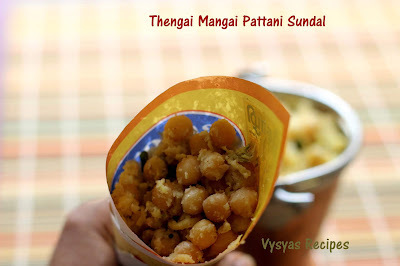 Thengai Mangai Pattani Sundal is a Version of Beach Sundal. It is made with White Peas, Spiced with chillies & Ginger. Tangy taste of Raw Mango adds additional flavour to Sundal. Usually we get this hot Piping sundal in Marina Beach. Muching the sundal & enjoying the Sea shore is really awesome. Prep Time : 7 - 8 minutes. White Peas - 1 Cup(dried). Coconut - 1/2 cup . Soak the White Peas with needed water for 8 hours or Over night. Pressure Cook the White Peas for 3 Whistles with needed water. Grind Coconut + Green Chillies + Ginger + Salt into a little Coarse Paste. Heat the oil, add mustard seeds,when it splutters add urad dal & curry leaves. 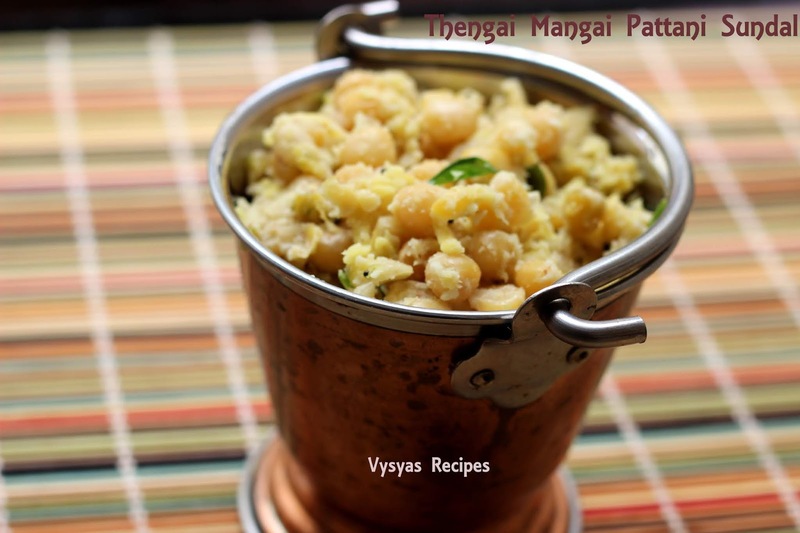 When dal's turns light Golden colour, add Cooked Peas after draining the water completely. Add Ground mixture, saute for few seconds till the moisture in it goes off. Then switch off the flame, add lemon juice & Garnish with fresh Coriander leaves. Add Grated or finely chopped Raw Mango while Serving. Enjoy the Beach Sundal. Add a Green chillies while tempering. you can add onions,while Garnishing with Coriander leaves. you can add 1/4 tsp of chilli Powder for additional flavour. you can add Grated Carrots while serving.